Coalition partner New Komeito and regional allies show support for more involvement in regional security. The government of Prime Minister Shinzo Abe has seen some modest gains this week in its attempts to normalize Japan’s military posture. Both regional allies and the ruling LDP’s coalition partner New Komeito have indicated they are interested in seeing Japan be able to more comprehensively defend itself, and contribute to regional security alliances. Abe will surely press ahead with these gains, as China and Japan have both been unable to normalize tension in the East China Sea since the Japanese government’s purchase of the disputed Senkaku/Diaoyu Islands in August 2012. 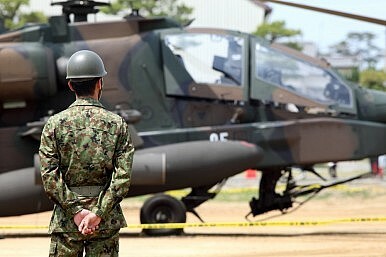 To begin with the domestic front, the LDP and New Komeito on Thursday came to a broad agreement for Cabinet approval of a limited right to collective self-defense, according to sources who spoke with the Japan News. The LDP is seeking to have a joint Cabinet statement ready by June 22 when the current Diet session ends. The new agreement is expected to be based on a view submitted by the 1972 government of Prime Minister Kakuei Tanaka, in which the right to self-defense is allowed only when “the people’s right to life, liberty and the pursuit of happiness would be fundamentally undermined.” The government source said New Komeito had come to this new interpretation because of a scenario the Abe administration has been publicly emphasizing for weeks; the prospect of U.S. military ships transporting Japanese nationals from a conflict zone. The junior coalition partner said such a situation could well involve the people’s right to life and the pursuit of happiness. New Komeito asserts this is a much more limited interpretation of collective self-defense than the LDP had initially envisioned. However, the LDP feels it can use the agreement as a starting point for later negotiations. Internationally, Japan and Australia’s foreign and defense ministers have been meeting this week for their first two-plus-two meeting since 2012, and the fifth such meeting overall. On Wednesday, they agreed on a bilateral pact to jointly develop defense equipment. There have been media reports earlier this month suggesting Australia is interested in Japanese submarine technology, and perhaps purchasing several Soryu-class submarines. The two sides released a joint statement confirming “the substantial conclusion of negotiations” surrounding the pact. In addition to Australia, national security advisor Susan Rice said the U.S. wants to “deepen trilateral security cooperation and interoperability” with Japan and South Korea. Rice was speaking in the context of defending against North Korea’s “increasing provocations.” She also said that the U.S. and Japan were updating defense cooperation guidelines, something that hasn’t been done in almost two decades. This week’s events will be viewed as important steps by the Abe administration on Japan’s path toward collective self-defense, and ultimately the possible normalization of Japan’s military. Certainly the support of allies like the U.S. and Australia will be instrumental in rationalizing Japanese participation in guaranteeing regional security. While obviously not intentional, Chinese disputes with the Philippines and Vietnam in the South China Sea fuel regional unease, and lead countries to attempt to rebalance the situation by seeking greater Japanese participation. With a small and scattered domestic opposition at the moment, the LDP is seizing what it sees as an opportunity to fundamentally change Japan’s security playbook. The months between the current Diet session and the next one this fall will show how far the Abe government thinks it can push its advantage.